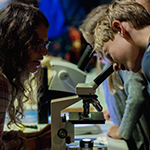 Dive into the exciting world of earth, ocean, and atmospheric science with researchers from Scripps Institution of Oceanography and UC San Diego. Learn about current research areas, meet and talk with scientists, and get your STEM (science, technology, engineering, and math) career questions answered. Open to students in grades 6–12. Those under 15 must be accompanied by a paid adult.